I have used Gmail on portable browsers such as PDAs and cell phones. It knows how to format. There is also a Java applet for several cell phones that works well too. I was going to send you an email but this might work as well. i couldn’t got the grease monkey to work. I DL, got script, made simple edit to JOE JOe and it didn’t show up in Gmail. I’m going to try it again. After I finish this little project. How’s England or is it Britain? I listened again to your pocast and noticed (see link) I put your name in the area and hit Ok. Did I put it in the right area? not so fast kemosabe. It’s not working and I been checking the script and it hasn’t change from when It was working. not working here either, but the page references for when I compose an email do not match the references that activate the greasemonkey script. Andy – Thanks for the ‘ tip. It solved my problem! Yea! Ah. I think I understand why some of you are/were having trouble. 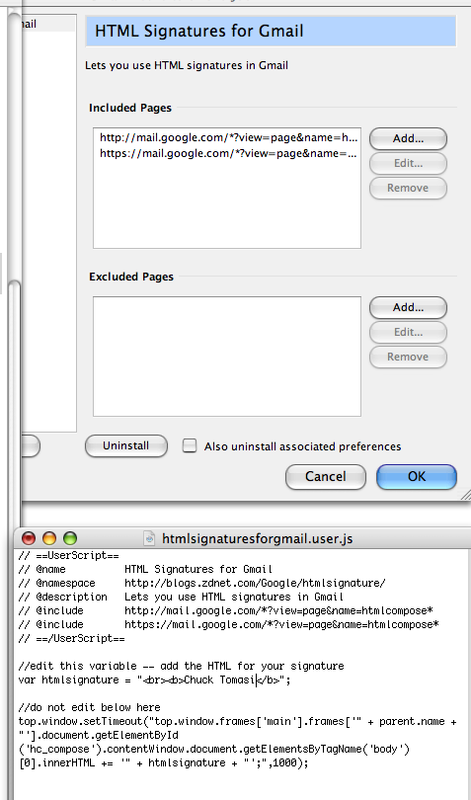 The variable ‘htmlsignature’ is essentially a string. The apostrophe s are used as the wrapper to indicate the start and end of the string. What makes this tricky is that the string represents HTML. Since HTML anchor and image tags often have a ‘src’ attribute that require string assignments of their own, we end up seeing quotes within quotes. Inserting quotes inside of quotes can get quite complex. As an exercise, can anyone think of a clever way to assign a quote of a quote of a quote to a variable? Keep in mind we only have apostrophes and quotes to work with, yet this scenario is indeed possible. and remember to click the red monkey head at the bottom of the Firefox page. also sometimes in Gmail it doesn’t load. I find by going to another link and then going back to Gmail solves the problem.